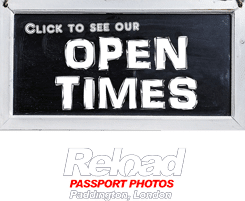 Reload Internet can capture, print and prepare your Zambian passport photo or visa photo in our dedicated passport photo studio located in Paddington, London. We have been in operation for over 10 years, and we take over a hundred passport and visa photographs every single week! We stay open from Monday to Sunday, early morning until late evening, and you can stop by at anytime you like, you don’t need an appointment! This makes us the easiest, most reliable & convenient passport photo studio in London. Our staff have been trained to provide you with a set of high-quality photographs that meet every single one of the necessary criteria stated in the official passport and visa photograph guidelines released by the High Commission of Zambia. We will provide you with a set of 6 photographs for just £9.99! We will capture your photograph using the latest camera technology, and print them using Embassy approved digital photo printers. We will cross-check your photographs to ensure they will be successful when you submit them with your application, and then cut them to the exact size required. 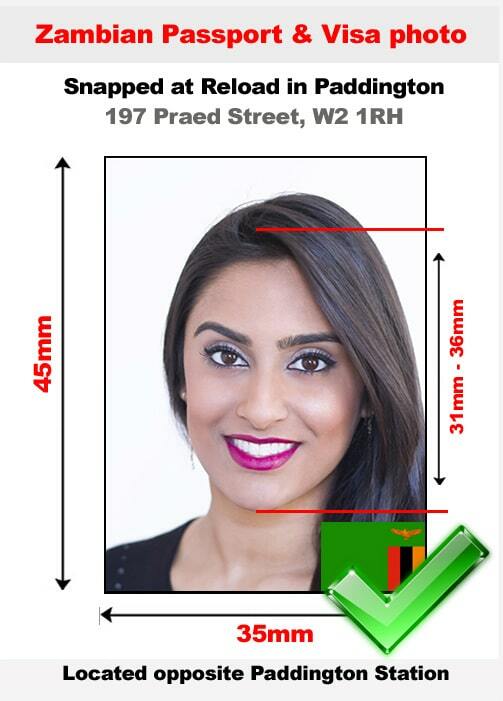 This is why we can guarantee that the Zambian passport photo or visa photo we produce for you will pass first time! Watch our video for more information on Zambian passport and visa photographs, or to see how quickly we can produce yours! Your Zambian passport photo or visa photo must adhere to all of the specifications below, as your application will be rejected should it not. At Reload Internet, this will not happen to you, as we guarantee your photographs will be successful when you submit them along with your application. Dimensions of Photo: 35 x 45 mm. Number of Photos needed: 2 color photos. Face must take about 70% -80% of the photo or 31mm to 36 mm space from chin to crown of the head. Dress Code- Dark or Black, Navy Blue or Gray Shirt or Top dress. No gold ornaments or other jewelry. No loose hair, natural hair and tied back. Face front with ears visible. A neutral expression in the photograph is appreciated, preferably with mouth closed, no smiles or laughs or frowns and not showing the teeth. Keep both the eyes open, artificial expressions like raised eyebrows or squinting are not allowed and accepted. Keep the head of the person to take the photograph in a shape of a square. In other words, it should neither be turned nor kept at an angle. And also not rotated or tilted even slightly. The person’s eyes and face must be focused straight towards the camera such that the pairs of ears and cheek of the photographed person are seen clearly. The person must look straight at the photographer and not keep the eyes closed or half closed. The eyes must be easily visible and hair or eye glasses should never hide the eyes. The camera lens must focus on the photographed person’s eye level and neither above nor below the eye level. High-quality paper is required to print the photo thus taken with a print resolution of 600 dpi at least. (Particularly when the photograph is taken with a digital camera). The color of the photograph must be in neutral colors and must match natural skin tones. The photograph must contain no folds or dirt. No photo manipulations allowed, for instance removal of spots. Even though head wear is not allowed generally, a few exceptions may be made, particularly for religious reasons. In that case, the face of the photographed person must be seen from lower tip of the chin to his/ her forehead. And the face of the photograph must contain no shadows. The specifications listed above are based on the High Commission of Zambia’s passport and visa photo guidelines, which you can see here. Come to Reload Internet for your Zambian passport photo and visa photo, to avoid any unnecessary delays that could occur due to a photo error.